I have a few more samples from the clubs and parties I had last week. The first one is a hinge card. This technique was shared with demonstrators in our monthly magazine, Stampin' Success. I used the Crazy for Cupcakes stamp set. I stamped the bottom of the cupcake in Chocolate Chip monochromatic designer paper(A must have!) and the top of the cupcake in some turquoise dp from the Pink Flamingo paper pack. This cupcake normally has a candle but we cut that part off and covered it with the punched out heart from the heart to heart punch. This next card is a partial case from a card I saw on SCS. I used the Polka Dot punches from the Sale-a-bration brochure. Sam ended up having a great 9th birthday. He spent most of yesterday playing with his new toys with his older brother. It was hard to peel him away from his toys to go to school today. We made this card at my Monday stamp club. I inked up the bird in pretty in pink craft ink and poured irridescent ice over the top and then embossed. The flourish and saying is from the Yummy Sale-a-bration stamp set. You can earn this set for FREE with a $50 purchase during Sale-a-bration. Today is my youngest' birthday. Sam is 9 today. He wanted to go to a rollerskating rink for his birthday so we did. Out of the 5 friends who came, 2 hadn't really skated before so they got real bored real quick. It was one of those parties where the kids kept asking what time they got to go home. Oh boy. We had birthday parties for our older two at the same place and we had no problems with theirs. Well, we made it through it, the birthday boy had a pretty good time(despite rollerblades that hurt him) and he's back home playing with all of his new toys. We are off to Perkins for dinner. That's where he wants to go. Have a great day! Don't forget to set your clocks an hour forward. Spring ahead! i've got 3 events I'm getting ready for this week. In preparation I have been playing with the new Sizzix boxes and Sale-a-bration products. This first one is the Sizzix Box#2. It is wrapped in the Rockabilly designer paper but you can't really see the embossed black stripe very well in this picture. I inked up the words from the Yummy Sale-a-bration set with Basic Black and Real Red markers and then punched it out with the wide oval punch. Inside are a dozen hershey nuggets wrapped in more of the Rocabilly designer paper. Next up is the Sizzix Bag with Scallops. I used the Parisian Breeze Specialty Designer paper. This paper is gorgeous, with lots of texture and it is cardstock weight so it holds up very well when making a bag like this! The flower is from the set, Eastern Blooms. The last project for today is an Easter card using "A Good Egg" stamp set and the Sale-a-bration designer paper pack. I based it on this card I saw on SCS. I cut out the egg with my oval Sizzix die and then stamped the middle band on dp and cut it out and layed it on top of the egg. I put on some crystal effects and glitter but you can't really see it in the photo. No time for chit chat today. Thanks for stopping by! For this week's recipe challenge I combined the challenge with a technique called Cracked Glass. You can view a tutorial for it here. The recipe challenge this week was to used patterned paper, 1 or more hearts, and ribbon. Check out what the other gals on the recipe challenge team came up with on Tamara's blog here. I thought this Sale-a-bration stamp set, Botanical Blooms, lent itself nicely to this technique. We did this technique at stamp club last night. It can be kind of putzy but I think it's worth the effect! I haven't started on the Valentine's for my kids classes yet. Yikes! What is everyone doing this year for Valentine exchanges? This is my favorite time of year in the Stampin' Up! world - Sale-a-bration. That's because this is Stampin' Up! 's biggest promotion of the year and everybody wins! Customers can earn one of four stamp sets, a ribbon bundle or pack of designer paper from the Sale-a-bration brochure for each $50 in a single purchase. Hostesses can earn a free Sale-a-bration product for every $300 in party sales. New recruits can earn ANY stamp set out of the catalog for FREE. Demonstrators can earn free stamp sets for their sales during this time. See, everybody wins! Sale-a-bration runs from February 1 through March 31. Here are some samples from one of the stamp sets you can earn for free called Botanical Blooms. Isn't it lovely. The ribbon in the first card is part of a ribbon bundle that you can earn for free and you can see a little bit of the designer paper you can earn for free in my third card. You can place an order online through my demo website by clicking on the picture of the catalog on the right hand side of my blog or by clicking here. 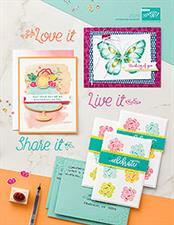 Also, from Feb.1 through April 30 you can get a FREE Stampin' Up! 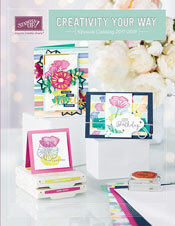 Spring/Summer catalog when you place an online order! Bonus! And I'm starting a punch card program Feb.1 that for every single purchase of $50 or more will get you a punch on your punch card. Once you get 12 punches you will get a $25 Stampin' Up! gift card from me! Double bonus!!! Don't ya' love free stuff?! Don't like to order online? You can also contact me at krhopperstad@juno.com to place your order. I'll be back with more Sale-a-bration samples throughout Sale-a-bration. Have a wonderful day!